The Environment Ministry started a two-day National Stakeholder Consultation Meeting on Biodiversity Finance Initiative to conserve India’s biodiversity, here today. This National Stakeholder meeting has been organized to understand the BIOFIN project and to seek professional inputs from experts of various fields in strengthening the biodiversity conservation efforts in the country. The objective of the meeting is to introduce the BIOFIN project to the various stakeholders, enumerate the programmes/activities being undertaken by different organizations in the context of India’s 12 National Biodiversity Targets developed in line with 20 global Aichi biodiversity targets, and then assess the expenditure being made by different organizations for activities related to biodiversity conservation. A global high level panel set up by the Convention on Biological Diversity has estimated that USD 150-440 billion need to be invested annually in biodiversity for effective implementation of Aichi global biodiversity targets. Besides the central and the state governments, the NGOs, central public sector undertakings, and the private corporate sector play an important role in this context by taking up specific projects/works, which directly promote conservation of biodiversity/ relevant for biodiversity, and by contributing to policy making. As part of this study, an assessment of expenditure is also being carried out. This national meet would serve as a forum to share the collective expertise and ideas of different stakeholders - both government and the civil society institutionsand especially the corporate sector on the implementation of the Biodiversity Finance Initiativeat national, state and local levels - to ultimately bridge the gap between available and required funding for biodiversity conservation in India. The Ministry has partnered with the United Nations Development Programme (UNDP) in a global project on Biodiversity Finance Initiative (BIOFIN). The experts have gathered to attend the consultation on January 14-15, 2016. Scheduled over two days, the meeting will see over 200 participants from various Ministries, Central Government Institutions, State Biodiversity Boards, NGOs, Public Sector Undertakings (PSUs), educational institutions and the corporate sector. Addressing the National Stakeholder Meeting on BIOFIN, Shri Ashok Lavasa, Secretary, MoEFCC, explained thatthe idea behind implementing BIOFIN is to first assess the gap between the ‘available funding’ and the ‘required funding’ for biodiversity conservation and then to plan for resource mobilization. The meeting also saw opening remarks made by Director General of Forests & Special Secretary, MoEFCC, Dr SS Negi, Special Secretary MoEFCC, Shri Hem Pande, and Deputy Country Director UNDP, India Ms Marina Walter also made opening remarks. 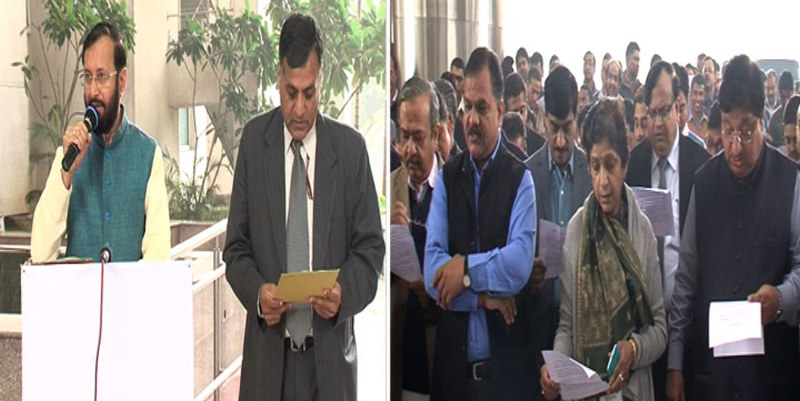 Minister of State (Independent Charge) for Environment, Forest and Climate Change, Shri Prakash Javadekar today administered a pledge to ensure good governance to the officers and employees of the Ministry at Paryavaran Bhawan, here today. • To take steps for public participation in governance to enhance government’s effectiveness. Secretary, Ministry of Environment, Forest and Climate Change, Mr Ashok Lavasa, along with all departmental heads also took the pledge of good governance.